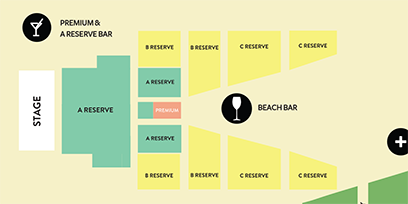 There are three pop-up bars at Coolangatta Beach, exclusively for Griffith Opera on the Beach — Aida. The flavours of northern Africa and the Middle East come together in a range of menus designed to complement Verdi's Egyptian masterpiece. You can also let us prepare your picnic for you with our selection of premium hampers. Choose from the Radamès Hamper ($95 for two) or Amneris' Basket ($75). You can add a picnic basket to your cart after you've selected tickets. Then all you have to do is pick up your picnic basket from the Foreshore Beach Bar when you arrive at Griffith Opera on the Beach. Inside will be premium quality disposable plates, cutlery, and napkins. And the picnic basket is yours to keep! A waterside bar, exclusively for Premium and A Reserve ticketholders. Let us prepare your picnic for you — all you have to do is pick up your picnic basket from the Foreshore Beach Bar when you arrive at Griffith Opera on the Beach. Inside will be premium quality disposable plates, cutlery, and napkins. Simply add the hamper of your choice to your cart after selecting tickets for Aida on the Beach. If you already have tickets, simply sign in to your account and go to 'upcoming performances' to add a hamper to your booking.